A week ago, I woke up thinking about Paul Goodman. Specifically, I was thinking about his book of political essays, Drawing The Line. Goodman calls his book "a pamphlet." When I inquired at Amazon.com about its current availability for sale, I found that the book does seem to be available, though only from third party sellers, or in a Kindle edition. That means, I conclude, that it is out of print. I also found that the title, "drawing the line," is fairly popular, having been affixed to books about the Mason and Dixon Line, constructive discipline for children, and the artist Keith Haring. Among other books with that title. Goodman's book was first published in 1945. It was republished in 1962, with some additional essays added, and this is the edition I read (and that I have heavily underlined). Goodman's main idea is that each of us must be willing, at some point, to draw a line "beyond which we refuse to cooperate" with society and its demands. As a war resister, I relied upon Goodman's arguments. Having just now reviewed my annotations, I continue to think that his anti-war essays are right on target. 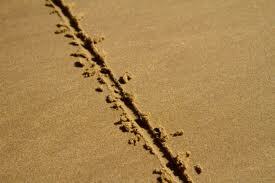 I actually woke up thinking of the phrase "drawing the line" in a different context. I woke up thinking that we can be successful in creating our own world only if we "draw a line" between the space we allocate to our own creations and the greater world of nature that surrounds and supports it. If in "wildness is the preservation of the world," we must preserve the "wildness" of nature, by drawing a line between our world, and that world, and then respecting that line. Urban limit lines, and the "precautionary principle" are examples of the kind of lines we need to draw. If we don't draw the line, it is "our" world that will be lost.